Threatened by the disturbing reality of print quickly becoming a thing of the past, the concern of who owns the rights to news and other content is also becoming more tangled. With online publications it's hard, if not impossible, to receive revenue from those reading the content. 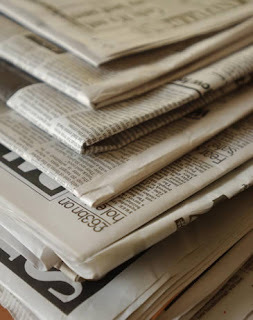 Yes, online newspapers do receive revenue from advertising spots sold but the annual volume of print advertising in U.S. newspapers since 2005 has sunk by $12.7 billion, according to the Newspaper Association of America. So then the questions arises, should online readers be billed for gathering open information? The Internet is, after all, based on the idea of convenient and free knowledge. A recent New York Times story revealed a new automated system that would enable online newspapers and magazines to charge for full access into its own publication, and other partnering publications, which could change the freedoms we have on the Internet. Just as an artist, not viewer, holds the ownership of a piece of artwork, the publisher would too gain ownership of an online newspaper or magazine through compensation. I posted an article somewhat on this topic as well. It talked about how news is becoming more and more frequent online without the use of newspapers. I think that eventually over time that the news will become a virtual thing, which means, unless newspaper companies do decide to start charging people to use their website for the news then they will go out of business. At the same time though, the access to that information "for free" isn't necessarily free at all. Newspaper companies that have online website do sell spaces to ad companies which helps them get revenue; plus online newspapers are vital for many people for research and information, so making people pay for that could cause potential loss of buyers. Does it pay to be young?